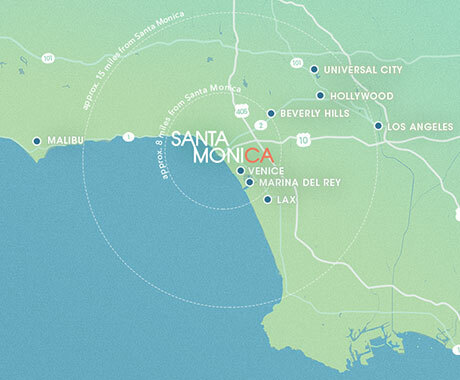 People might not realize just how international Santa Monica’s food scene has become. From Pico Boulevard to Main Street and Montana Avenue, you’ll find a tantalizing mix of modern and classic places that can trace their culinary roots to countries like Iran, Israeli, and Italy. Strong representation from Asia, Europe and South America makes dining choices even harder. 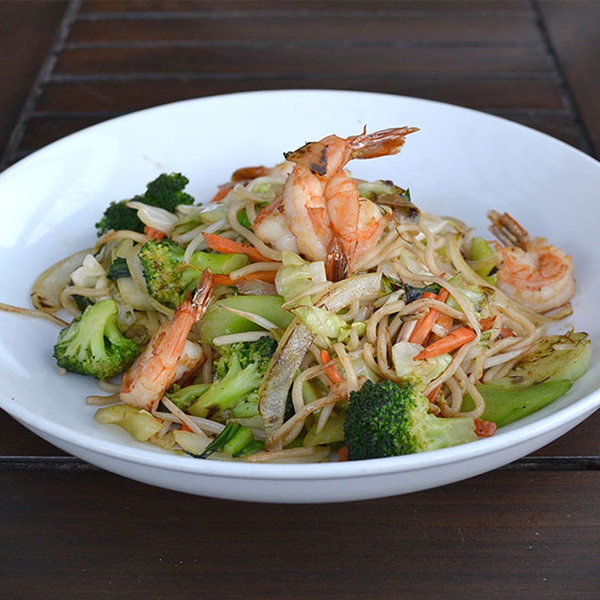 Taste the flavors of the world without leaving Santa Monica. José Carvajal has run Café Bolivar, a Venezuelan restaurant and coffee bar in Ocean Park Boulevard, since 2001. A mural and sidewalk seating give way to an interior with white walls and both bench and red metal seating. 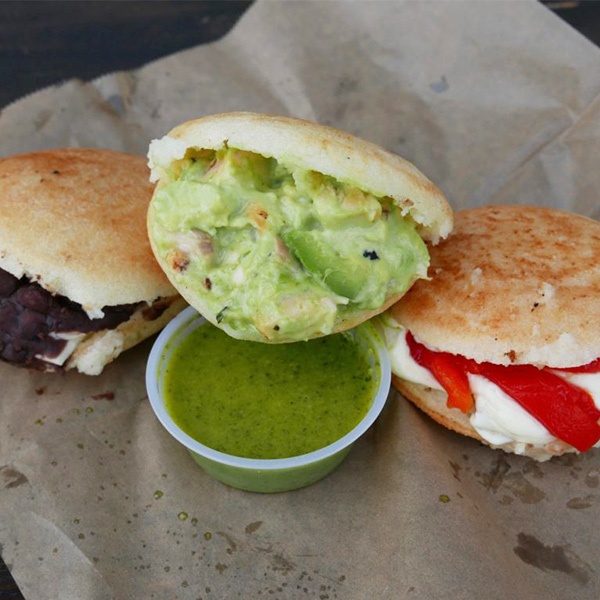 Café Bolivar specializes in Caracas-style arepas, white cornmeal pockets with crisp coats and creamy cores. Possible fillings include earthy Caribbean style black beans with fresh white cheese; juicy grilled chicken breast tossed in avocado puree, garlic confit, and rosemary aioli; and fresh mozzarella piled with crispy bacon and garlic and thyme infused roasted red peppers. Accompanying green sauce goes by guasacaca and has an alluring cilantro, onion, and lemon juice base. Crimson is part of a new generation of restaurants from April Heidarian and business partner Eiman Shekarchi, whose family owns several L.A. concepts. Their modern space features reclaimed wood, an Astroturf-lined patio and brick-walled interior with marble counters. An Intelligentsia coffee bar joins a tempting pastry case by the register. 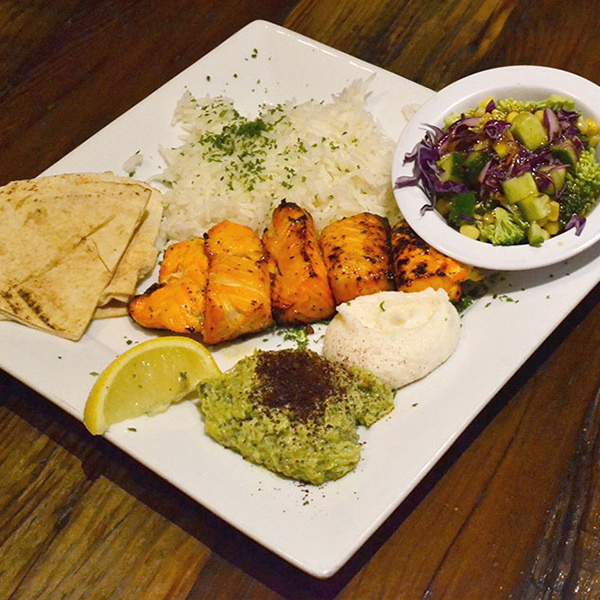 Persian-style kebabs are particularly well crafted, including ground sirloin and cubes of skinless marinated salmon. Each plate comes with pita, rice, and a choice of two sides. Smoky eggplant-based babaghanouj, creamy hummus crafted with garlic, lemon juice and tahini; and red lentil soup with onions, jalapeño and ginger all warrant consideration. 2015 saw the rise of Forma along Montana Avenue thanks to chef Piero Topputo, general manager Mario Sabatini, and business partner Robert Donnell. The Italian space touts exposed wood rafters, high backed orange cushioned banquettes, wood tables, a bar area with white subway tiles, and glass fronted cheese case. 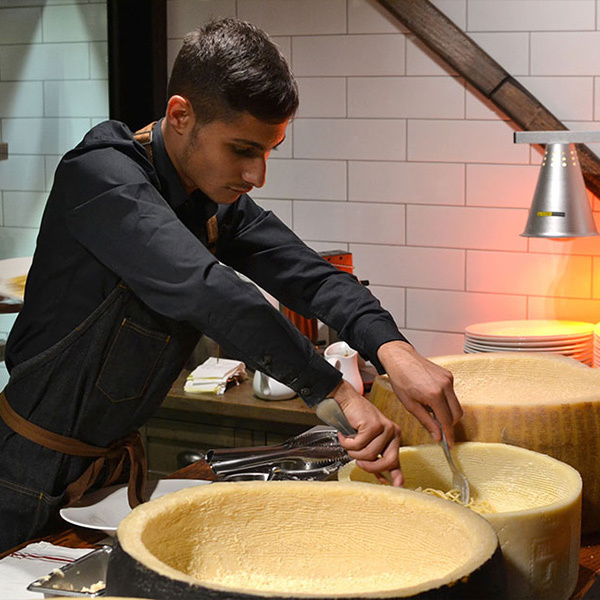 In back, servers prepare pastas dalla forma, tossed in huge wheels of cheese. House-made spaghetti with good bite is prepared cacio e pepe style, with black pepper, extra virgin olive oil, prepared in a wheel of sharp Pecorino Romano. The doughnut sandwich, a fun mash-up, features savory deep-fried pizza dough that’s sliced and stuffed with creamy stracciatella cheese, silky prosciutto, marinated zucchini, and arugula. Other highlights include chicken meatballs and artichoke hearts in light broth bolstered with Parmesan and “devil’s style” Cornish game hen. Forma also serves build your own cheese courses with appropriate accompaniments. Gilbert’s El Indio is a Mexican institution that the Rodriguez family has run since 1974. Matriarch Carmen Rodriguez, son Fernando, and grandson Andres now preside over a standalone building with mottled pink façade, Spanish tile roof, and Native-American statue named Gilbert guarding the back door. Cushioned burgundy booths front worn tables and paintings, customer photos, and actor headshots line the walls. The vibe changes throughout the day. 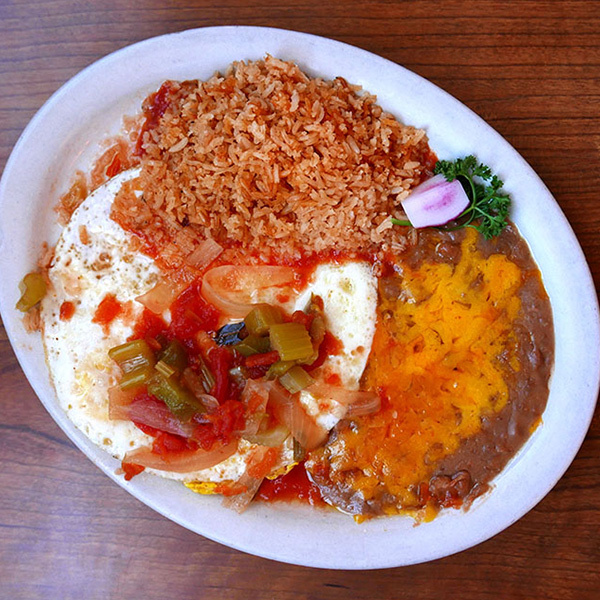 Locals show up for “early bird specials” like breakfast burritos, huevos rancheros and menudo (Friday-Sunday). Later in the day, they pile plates with tender carne adovada (pork steak in red chile sauce) and camarones al mojo de ajo (shrimp in garlic butter) that pair well with fluffy rice and refried pinto beans draped with molten cheddar cheese. People also flood Gilbert’s for margaritas by the glass or pitcher. Hummus Bar Express is the fast casual spinoff of Tarzana’s most popular Israeli restaurant, located along Third Street Promenade. The airy space features a towering ceiling, high-top seating up front, a secluded dining room in back, and railed patio with umbrella-shaded tables. Creamy hummus is available with an array of toppings, including mushrooms with caramelized onions and parsley, ground Angus beef with pine nuts, and falafel with nutty tahini sauce. Chicken shawarma is also popular, but “Middle Eastern” kebab fills out a more compelling plate, featuring juicy Angus beef shoulder patties seasoned with lamb fat, onion, parsley, and secrets. Cumin-dusted veggie rice is a solid side. No matter what, upgrade from puffy pita to oversized, pull-apart laffa bread. Javier Pardini is from Cordoba, brothers/partners Luciano and Pablo Alcorta (chef) are from Patagonia, and they teamed up to create an increasingly popular Argentinean restaurant group. Malbec operates outposts in Toluca Lake and Pasadena, and transformed Santa Monica’s higher-end Ushuaia steakhouse into another Malbec in 2016. Their westernmost Malbec features brick and wood walls, a full bar with flat-screen TVs, and grape leaf logo. A wood grill feeds on mesquite and features hormone-free beef wet-aged for 21 days. Highlights include entraña al chimichurri (10-ounce skirt steak with chimichurri sauce), lomo (beef tenderloin with applewood bacon, Madeira reduction and mixed mushrooms), and deluxe ojo de bife (ribeye). Regardless of cut, ask for fire red, house-made salsa diabla if you crave more kick. Argentina’s sizable Italian population accounts for house-made pastas like spinach and ricotta ravioli in tomato basil sauce with ricotta salata; and fettuccine with six types of seafood in tomato, saffron, white wine, and garlic sauce. Supplement with starters like empanadas filled with combos like spinach & cheese and sausages like morcilla and chorizo. 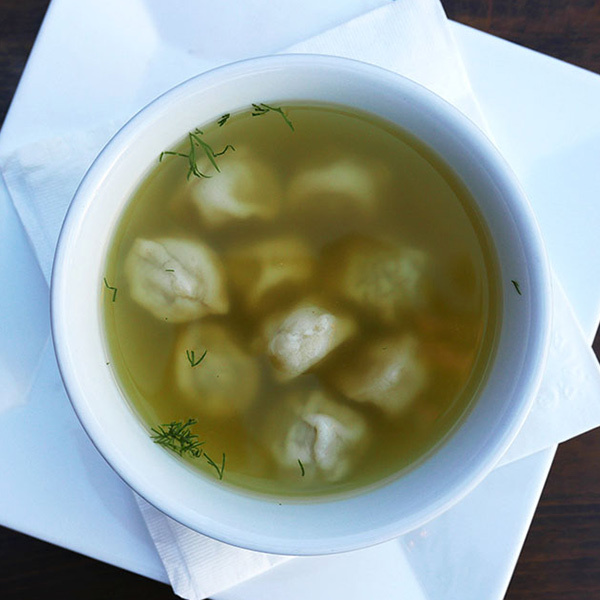 Krakow-born chef and owner Elina O’Lague debuted Warszawa in 1972 in Berkeley, relocated to Santa Monica in 1979, and served “Polish soul food” until 2015, when daughter Natasza took control. She renamed the restaurant, Solidarity, for a movement that helped topple the Polish Communist party. The space features a big back patio with wood fence, open-air bar, fire pits, red cushions, projection screen TV, and lively music. Inside, a house-like dining room contains wood tables and walls lined with framed photos. Hearty classics include pierogi with fillings like cheese and mushroom; bigos (hunter’s stew), golabki (cabbage stuffed with beef and jasmine rice), potato placki (pancakes) with sour cream and apple sauce, and chicken soup bobbing with lamb dumplings. More substantial fare includes chicken paprikash or roasted Long Island duck both served over spaetzle. Catherine An runs Tiato, named for a purple veined herb used in her mother’s Vietnamese style cooking. A brick-framed patio features beds of culinary herbs, and an airy dining room. 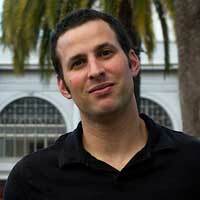 Tiato baits employees of nearby entertainment and tech companies with modern food on weekdays. For breakfast, Tiato offers chicken porridge with chicken meatballs and seaweed, a fried egg and rice bowl with Chinese sausage and crispy shallots, and an Asian chicken sausage burrito. Lunch includes hearty Vietnamese classics like pho, Mama’s wok noodles with an array of vegetables, and shaken beef starring cubed filet mignon. Atypical, but still compelling items, include a chicken banh mi burger with spicy mayo and pickled veggies on a toasted bun, and orange chicken with crispy leeks and garlic rice. A balanced beverage program includes soju cocktails like the Tiato martini with lemon syrup, cranberry juice, and the namesake herb. For dessert, Tiato sells approximately 200 chocolate chip cookies per day, so don’t leave without trying one, or possibly a double chocolate cookie if you’re going for it. 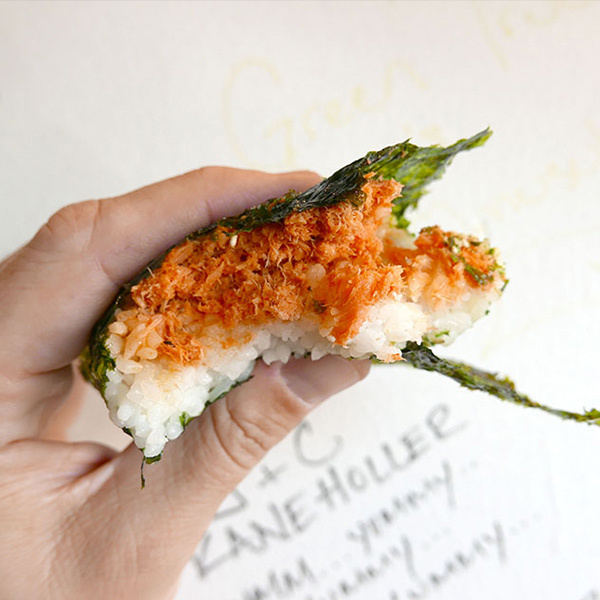 Keiko Nakashima runs Sunny Blue, a tiny glass-fronted Japanese rice ball shop on Main Street. The tiny store features a glass-fronted kitchen, patterned orange wallpaper, just four stools at a wood counter, and barely enough room to turn around. An overhead menu stars omusubi, all featuring hot rice dusted with furikake, wrapped with thin, crispy nori sheets, and served in cardboard boats. Signature curry involves juicy ground chicken seasoned with wafu curry. Spicy salmon involves rosy flecks of cured salmon seasoned with chile. Their most popular offerings include miso beef with caramelized onions and chopped shrimp with creamy mayo, though you should keep an eye out for specials like spicy tuna bacon and daikon edamame. Rice-free dishes include kitsune udon with deep-fried aburage tofu and pork belly herb salad. Dessert brings black sesame frozen yogurt. Z stands for zaytoon, which means olive in Arabic and serves as Z Garden’s logo. The Mediterranean restaurant originated near Santa Monica College and expanded across from the Third Street Promenade. Z Garden’s modern spinoff is open to the street, with wood tables, and a mezzanine with metal railing. Starters include Moroccan carrot dip seasoned with garlic olive oil, coriander, and cumin; fried beef and cracked wheat balls called kibbeh stuffed with seasoned ground beef, onions, and pine nuts; and fried cauliflower dressed with tahini sauce. Kafta kebab stars flavorful ground beef kebab with parsley, onions, and spices, served with yellow rice. Popular alternatives include rotisserie chicken marinated with Mediterranean herbs and grilled salmon topped with creamy lemon sauce. 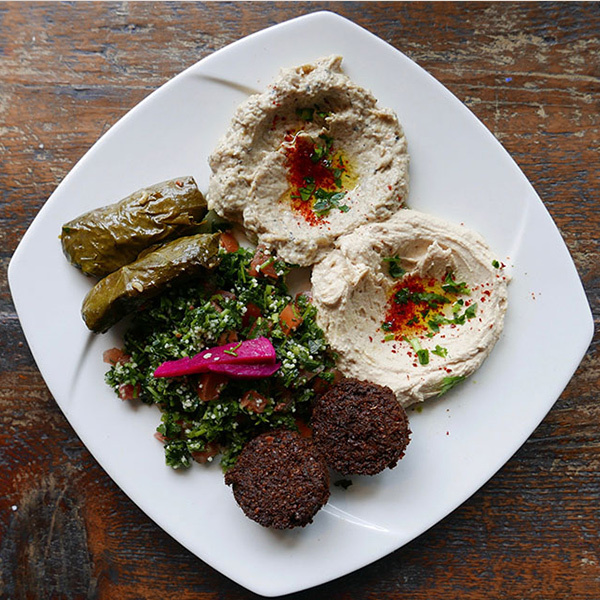 Vegetarian combo helps maximize variety by combining smoky baba ghanouj, creamy hummus, crispy falafel with green cores, tangy stuffed grape leaves, tabouli, and pickled turnips. Baklava is baked at the original Pico location. Still hungry? 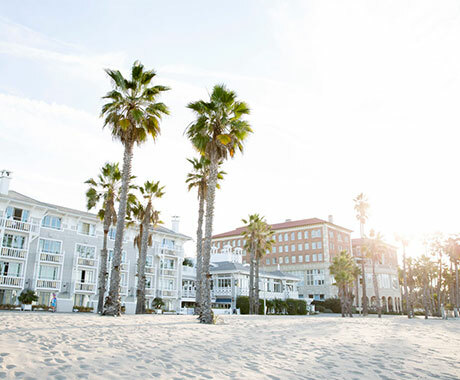 Check out a variety of restaurants in Santa Monica here.